And at the age of 27, the man known as the Baltimore Bullet and the Flying Fish, was primed to add clear water to any pretenders to the throne by netting a further seven golds to his burgeoning spoils of water-based combat at the London Games. The scene was set for history to once again be rewritten and to add to the spectacle Phelps would need to conquer one of the greatest rivalries in sport, on the greatest of stages, to take glory. The man most likely to end Phelps' gold run was of course Ryan Lochte - the 27-year-old who was the first man to break a long-course world record since the buoyancy suits ban came into place in 2010 and who won five gold medals in the 2011 World Championships by beating Phelps twice in the 200m freestyle and the 200m individual medley. The all-American fight for supremacy of the pool has proved a powerful narrative in the build up to the Games. The question is now, in the aftermath of Phelps' capitulation to Lochte in the men's 400m individual medley, is there any rivalry left? In fact, even to suggest Phelps had lost out solely to Lochte would be disingenuous as the American former champion finished fourth behind Brazil's Thiago Periera, who took silver, and Japan's Kosuke Hagino who sealed bronze. Lochte, on beating his double Olympic champion-teammate by a full four seconds, told reporters: "I'm in shock right now, but I knew I could win so I'm happy I could do that. "I know he gave everything he had, so I'll have to have a chat with him and see how he is after that." When he does Phelps may repeat the answers he gave to the press: that he had felt great for the first 200m but after that it "didn't happen". For the inward-looking Phelps the result will leave him much to ponder. He has been used to being within tenths of a second to his rival, whether in front or behind, so this will need some reflection, especially given the tight nature of the semifinal in which Phelps struggled to come through intact. Lochte, on the other hand, will take great confidence into Monday night's hyped rematch in the 200m individual medley. His gregarious personality may yet about to be challenged with the rigors of becoming a multiple champion, a test that Phelps' is well used to. For the neutral, the hope will be that this has not been the last chapter in what has been a captivating rivalry, one where the exploits and exertions of one has driven on the other to further greatness. Phelps is on record saying he has often thought about leaving the sport, if he doesn't bounce back on Monday maybe those voices will carry the day. Even if the outcome is not quite so dramatic, a key factor for rivalries to work is being close enough in performance to beat each other, a factor that is now is doubt. Phelps, more than ever, will need to recapture the form that built the legacy at the top of this page just to stay close. Lochte may have his eyes set on building a legacy of his own. "was primed to add clear water to any pretenders to the throne by netting a further seven golds to his burgeoning spoils of water-based combat at the London Games. " Nice hyperbole, but if you actually thought he had a chance at more than 3-4 golds, you are seriously uninformed. Phelps acted like a little spoiled brat after all the glory. Now he's getting a rude awakening that he's not invencible like he had thought. Hopefully Lochte will be more sensible in leading his life as a new champion. Eh, phelps still has 6 races left. Lets judge him after the other races are complete. Who cares either way? It\'s just swimming, it\'s not neuroscience. So Phelps won a lot of gold medals, yippee for him, he always has that. Michael Phelps won't do much this time around. He just doesn't care enough, which is why he was getting criticized by his own teammate (Tyler Clary) for not training hard enough. Phelps had his legendary 2008 Olympics, but this time around I don't think he'll really win anything, at least on an individual level. Its a disgrace that NBC refuses to show anything live on TV. They should never have the rights to any more Olympic games after refusing to show the opening ceremony and now refusing to show any of the events as they happen. What are we supposed to do? Not turn on any social media, TV, and go to no news/sports related websites every day so we can watch the events in prime time? While Michael Phelps was coming in 4th place, NBC was airing a interview with some old gymnastic coach no one cares about. Michael phelps is losing now that he cannot cheat wearing the buoyancy suits. His past gold medals should be revoked. I just don't get the media sometimes. You would assume the day's big story would be the fact that Lochte won, not that Phelps lost. Yet CNN decides to go with this absolutely negative piece. Talk about kicking them while they are down, eh? He has been taking too many hits from the bong. Michael Phelps is the greatest Olympian ever to date! Ryan Lochte has had the privilege to have him as friend, an idol, a competitor, a coach, and most important, a motivator. How lucky is he? Ryan will be the first to admit that Michael has pushed him to his best. Michael has been there and done it, and he realizes, as we all do when we get older and our bodies pay the price for our accomplishments, that it's Ryans' time. Why does the media build us up only to destroy us. How sad are we?...We should applaud what Michael Phelps has done for human sports in the generations to come. For God's sake, appreciate what we have before it's gone! There are so many positive twists the media should concentrate instead of sensationalism. This only sells headlines instead of conserving history, true dedication, and educating our children. Today's media is only looking to cash in on the opportunity for ratings. Michael Phelps has proven himself and it is up to us to realize that. You are a fool if you don't recognize that, and you are a hypocrite if you capitalize on it. He could have simply retired, yet he didn't. We as human beings should be extremely grateful for Michael Phelps and his dedication to the sport, even after him knowing he could not duplicate his previous accomplishments. We should be celebrating that Phelps was human enough to participate and hand over the torch, to his good friend and protege'. In the end, Michael Phelps is the greatest Olympian to date. And of course, someone will eventually be better than that. I hope Ryan can beat him in all events. To me, that would be the greatest gift Michael Phelps can give humanity. He's already done it, and he is kind enough to continue to share his accolades to inspire new generations instead of secluding himself , when he had already reached the peak. People, be real. Don't be so ignorant to blind yourselves from what he has already done...for us...and for your children. I salute Michael Phelps and I am grateful he was here in my lifetime. I also hope Ryan Lochte can surpass that. That is the essence of competition and always wanting to be the greatest. But we should all be grateful for what these individuals have done. It is truly a gift that we are witnessing this in our short lives span. We really take things for granted, and the sad thing is that it is right in front of our eyes. Life is too short, recognize and appreciate what is around you. To me, both these athletes are an inspiration to humanity. There is always a faster gun, and no one can remain # 1 forever. I imagine that Phelps, who set the standard, is just dead tired inside, and even though trying again at this Olympics, he may just not have it inside to prevail. But perhaps he has a little something up his sleeve, as he initially decided to pass the 400 IM to begin with. Even if he does not perform to Gold standards, he will remain the greatest swimmer of all time, for some time. Phelps has nothing left to prove and that is why he isn't on top anymore. But who can blame him? Michael Phelps didn't train for this event until the last minute. Too bad for him and good for Ryan Lochte. Glad to have a real compettion among American swimmers. Makes it more fun to watch. No one, no matter how good, stays on top forever. Phelps should be happy with what he has accomplished thus far and then try to be happy for those who will surely beat all his records someday. And remember: They're just sports, folks! No one should take any of them too seriously. I'm in awe of all these guys. As a former competitive swimmer, I can imagine how much mileage they put in working out for these games. Thousands of gut-splitting yards PER DAY. The difference between the 1st place finisher and the last place finisher is purely genetic. That's the level these guys are competing at. The times they're posting now are body lengths ahead of the world record holders' 20 years ago. The media will build you up just to tear you down.. Ask Michael Vick! I agree. We should be celebrating Ryan Lochte and his win, not talking so much about Phelps losing. I hope we can do the same all during these Games, as the U.S. will surely lose many events to others. Let's try to praise the ones who do win, rather than going all "boo hoo" over any U.S. losses and making excuses for the U.S. athletes. It simply creates a story for the press. This way instead of celebrating a Gold, we are wondering why we have the Gold we have. Sad. That's what happens when you try and win without taking drugs. Just like Ben Johnson and the sister who's in jail right now. She broke records in every sprint and the relays and four years later, she couldn't even quilify in anything. There was a Danish woman, Ragnhild Hveger, in the 1930s that sat 44 world records during her career, so the 29 WRs Phelps has can only be alltime for men. She also holds the record for most WRs held at the same time, 19. I think Phelps will come back and get at least 3 more medals in the next couple of days to get that record he desires. They don't have to be of gold, he already holds that almost unbeatable record, though I think he will get at least 1 gold, from a team event. If after the next 6 races he still does badly then fine, the rivalry is gone. This is one freaking race. Good grief. M. Phelps is an arrogant punk, that doesn't even want to celebrate with the rest of the Olympians from the U.S. now how special does that make him? I love to see anybody make history, but in his case I think we've had enough of him. So I guess it's time for him to go back home an look at his medals. The reason that NBC is not showing anything live on TV is because their is a 12 hour time difference between the US and Great Britain. Figure it out. In other words, Duh. So the demon weed transformed the greatest swimmer ever into a 4th place finisher at the Olympics? Are athletes able to maintain the very peak performance over the long term? Tiger Woods? Except he is only 27. Anyway MSNBC needs to be cut off. Isn't there an on-demand and live internet British station running coverage? Given what Michael Phelps has accomplished in Beijing 2008, it would be difficult in my view to repeat such a performance. Every athlete reaches a peak in their career before they wane. Michael Phelps has already indicated that this will be his last Olympics. Take nothing away from Ryan's performance. He deserves the spotlight. He has worked so hard and consistently over the years. However for those who are quick to anoint Ryan Lochte as the next sensation, let us start the comparisons after he wins several gold medals in a single Olympics like Michael did in Beijing. AWESOME reply B Mesa!! You are so right!! It is a tragedy that people would prefer to force to the two individuals to speak negative of each other, when the main thing is, THE GOAL REMAINS IN THE USA!! Placing all of this attention on Phelps loss is still not honoring the hard work Ryan Lochte has done to win!! The focus should be on him!! keep with the bong a gold medal for the American loser. What happened to the true spirit of sportsmanship? Of course it's great to win, but we can't always win. Hooray for all the swimmers competing in this Olympics. Phelps has done a great job and will continue to do so. Olympics and other events in swimming or any events should change its law and should not allow a single individuals to participate and win more than 3 medals. Someone's is born a freak or genetically altered to beat rest of the world but to to dominate overwhelmingly is not fair in any game. There must be some sort of 'antitrust' to check the monopoly and give rest of the world a fair chance to have more athletes to participate and win evenly. Phelps has already 8 medals from last Olympics, isn't it fare to give chances to new young swimmers ...... ? Phelps thought he could cruise to more gold without paying the price to be in prime condition–he's been smoking too much dope and getting his ethics from the people who sell pot to him. China winning gold in swimming means only one thing: Steroids. The thing to remember here is that Lochte came into this event the reigning world champion. It's not totally unexpected that Phelps couldn't throw him out of his own house. I'm more interested in the events that are Phelps' best. The next meeting might not be a blowout. Maybe Phelps did so well in Beijing in 2008 due to the high tech LZR suit which was designed by NASA . The suit made individuals more buoyant and compressed the body to create less resistance. The Olympic Committee has since banned the suit. It was the buoyancy suits all along. What a great comment B. Mesa! First, I am going to have to go with the comment about CNN's reporting...DITTO!!! Why is the big story about the loser instead of the winner! Rediulous, lousy reporting. Second, the comment about the live coverage. DITTO again. What in the world is going on here!!! A LOL to the comment about "interviewing an old coach no one cares about while Phelps was coming in 4th." NBC...you are fired!!! Really...how did you get the games this year anyway??? Going online to watch live...and your ad revenue with me. Congrats to Lochte. An Olympic gold medal must be so thrilling to earn. I'm really tired of the stupid hype of Lochte vs. Phelps, the media is so ridiculous. It's not the Lochte-Phelps Games, it's the Olympic Games. Cheer on the Americans and stop pitting the Americans against each other in a battle royale that's obviously not a sure thing. Give up the contrived rivalry, CNN, and let's just cheer on the Americans. Shame on you for focusing on Phelps' loss instead of Lochte's first Olympic gold medal. GO TEAM USA! @mary...there's a 6 hour time difference between the eastern US and Great Britain...not 12. And, NBC and the other networks that have covered the Olympics in the past have shown delayed broadcasts during most of the games in other parts of the world. Who cares if they are delayed...at least NBC can edit out some of the time delays and provide the viewer with the "meat" of the games. It just looks like Phelps really doesn't have his heart to win it all. He is there to have fun and doesn't really care about every race. He really wants two more gold to set the record...which I am sure he will get. So he is saving himself for those races. Michael Phelps is a great swimmer. period. Ryan Lochte is a great swimmer. period. I respect both their accomplishments. period. I know he still has some more races (what does he get, like 10 shots at a medal?) but he still hasn't shown up for more than one Olympiad, so he aint no Carl Lewis. It's not that who won against whom... it shows who has put lot of effort to reach their destiny. Phelps have been set back, may be he couldn't warm-up properly. I'm sure there will be a good show, up-coming in the London Olympic 2012 swimming events..
Mitt is a Twitt !!!!!!!!! I think Phelps was super impressive in 2008 but became cocky and lazy thereafter. Tonight, he couldn't even look into the camera to explain why he performed so poorly. He's human... I get it, but have some respect because you are an olympian, a gold medalist, and there is always someone younger and hungrier than you who could have been in your spot. Mr Phelps, I am proud to have you represent my country, but I am not proud of your attitude. Tonight, you were served a slice of humble pie. @ AuntyViolet: If you don't care, why are you on this thread commenting. Perhaps you should save your breath and time reading articles about things you care about. To reach the level of Olympian swimmer you must immerse yourself into it, and that takes a lot of self-discipline. It's hard for me to stomach people criticizing others, unless you perhaps are an Olympian and know that it takes? Michael Phelps has already proved his is THE Best swimmer ever. The only way to take that away from him is for someone, trump what he did 4 years ago. This article is a sad attempt to create drama out of a swimming event. Congratulations to Lochte the new champion of the 400m medlay. Phelps is a great champion who has aged. It's all pretty normal. Sports writers are so imaginative. To wit: "...the last chapter in what has been a captivating rivalry..."
Phelps is great olympian and a true swimming champion recognised by the global community. It's a pity that the armchair experts emerge in numbers when a champion fails to perform at a major global event. Hey, the Olympic athletes are not robots, they have feelings on and off days just like you and me. So get over it and support Michael and his team mates for the next 2 weeks. Latynina's record will stand. He's got no more mojo. Everybody ages. Even Carl Lewis eventually got slower. Not everybody can be a Dara Torres. To Joe Ramos. You're pathetic! go behind the couch and cry like a baby you sore loser! please be noticed.... the chinese flags blocked our camera view in swimming race . They must setting up for that ... We – American people- we love our team . we support for USA team. We dont want their flags in our face !!! Tell everybody....and tell NBC to stop them ...thats not a fair play ! Here is the thing. When these races occur, the press and the world reports on events like the athletes were machines. They have so many stats at hand, and such a good background of what has occurred, that I think some people get a bit cocky about predicting races, and creating a rivalry. But the fact of the matter is these athletes are people, people that may have a good day or bad day, people that maybe couldn't get a good night's sleep or maybe people under the weather now and then. That, overall really is what makes the Olympics fun to watch. Lets not rule Phelps out because he has had one bad day, and by the same token, lets stop putting so much pressure on him to succeed. Lets just watch and enjoy. Sharkskin swimsuit is not allowed this time, I will be surprised if he can get more than 2 golds. I am missing your point about Phelp's body getting older and paying the price, and it now being Lochte's time–after all, they are the same age aren't they, and have spent the same amount of time in the pool, no? Dave – you're closer than Mary, but still not there. 5 hours ahead. One should remember that going to the Olympics is a matter of representing one's country and not rivalry between players. But he STILL has accomplished more than you ever will.Let that roll around in your head for a bit. I had a witness of Phelps's moment of fantasy in beijing,I beleive he could do it again as long as he starts with a clean slate. Please be yourself man,I know you can do it! I want to know if Phelps has won any medal since the ban of the high tech suits..if so then it couldnt have been the suit, if not then i will have to agree that its been the suit all along! Go on Phelps and prove the haters wrong! oh my god, which nitwit said that Great Britain has a12 hour time difference with the U.S.? From NY it's 5 hours and from CA 8 hours. When will Americans learn there is another non-American world out there!! 12 hour time difference? More like 5 from est, 6 from cst, and 8 from the pacific. For those who followed Phelps' prep more closely will know that this was going to be prob his worst event. His coach at some point mentioned their tranning would focus more on the 200m IM, 100/200m butterfly comming into these Olympics. Surprised nothing about this was mentioned on the media though... So perhaps this result wouldn't be as surprising as apparently was. I'm sure he'll do much better on his next events. Just like his idol Michael Jordan, he has failed to reach his mark. I think he will rebound and win some gold, but even if he doesn't, he will still be the one who won all the gold at the Olympics, as one of the greatest atheletes, of our times, just like his Jordan. I still hold Phelps in the highest regard, as should all Americans, and the world. One of the reasons Lochte trained so hard was to beat Phelps. there wasn't anyone for Phelps to try to beat.... though I don't think it ever occured to him that he wouldn't place in his first event. He still has other events. But I think everyone should focus on Lochte more. Maybe Phelps was just off. It's hard to sustain the kind of energy level that he did in the other olympics.... I hate NBC's coverage. Too many stupid interviews in the studio. Just cover the events as they happen! Lets hope that we won't read any news about the discovery of doping to any of the past winners who can't perform now without doping. Seriously hope so. Lets also hope there's no doping to current Olympians. It's a disgrace greater than not winning any medals. Its a shame the media are focusing on Phelps poor performance, rather than Lochte's great victory. The ups and downs are what makes competitive sport at this level so fascinating. Well done Lochte. 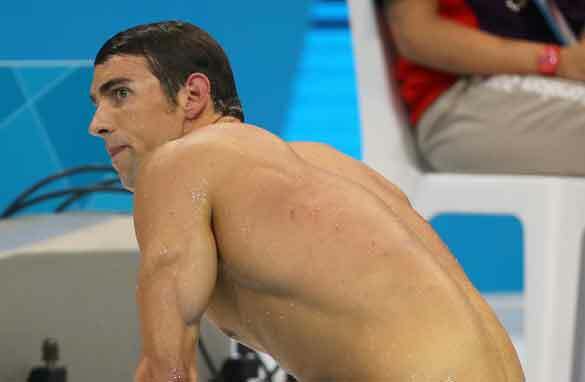 One loss and everybody thinks that michael Phelps doesnt have it anymore. Mark my words. Michael phelps will win at least three gold medals. Phelps will be back when he commits and focuses with the same undivided intensity he had when he was a nobody that led him to victory and earning 8 gold medals in 2008. Phelp's body getting older，like USA. Mr. Michael Phelps, I am an American and you aint got nothing else you need to prove. Your performance up to this date has been miraculous. Buddy enjoy the games and puff one for granny when you get home. In recent interviews, Michael Phelps has seemed uncaring about the outcome of the Olympics. His body language and attitude tell his story – I'm tired of swimming and I just want to rest on my laurels, but my Mom made me come to just one more O-games. Let the guy finish and go home to relax like he obviously wants to. Phelp is an icon. Please give him credit for what he has done in the field of smimming. Think about Tiger Wood (golf), Mike Tyson (boxing), Micheal Jordan (basketball), and Pete Sampres (tennis), these guys at one point were untouable but there is always someone somewhere waiting for their turn to set a record. Please judge Phleps at end of the remaining six events left for him. As of today he is still the greatest swimmer ever lived. Phelp still rule the world of swimming despite one set back. He will definitely bounce back. This is the second article I've read on CNN that specifically mentions the loser of the competition, and how horrible things are for them. Must we always focus on the negatives? Can't CNN simply acknoweldge the wonderful accomplishments of these athletes as well as those who did succeed? The spirit of the Olympics is supposed to be positive, cheering on the underdog! The underdogs are winning, can we cheer them on please? B. MESA-You said it all! "Phelps acted like a little spoiled brat after all the glory. Now he's getting a rude awakening that he's not invencible like he had thought." GB How many Olympic gold medals do you have again? Zero. With zero chance of winning one. Arm chair atletes are a dime a dozen. Phelps is easily the greatest swimmer of all time. AND arguably the greatest Olympic athlete ever compete. Period. Michael would have done well even if does not win another. Forbs said he eaened $46m over time. I do not think he will be in the soup line comes what may. His legacy is intact. It would be nice if he can gross the 18 medals to set the all time record and come home!! These 'rivalries' are nothing more than made up crap by the media to stir the public. I am sure that this is not the END for Michale Phelps. Nor do I think that he and Ryan sit around thinking about it much. They are both extremely gifted athletes who are doing their best to win. Period. Let's not tear Phelps off of the pedestal and put Lochte on in his stead after just one 2012 Olympics race. Perhaps Phelps hadn't gotten enough sleep the night before or had the runs and was recovering or something. . . Who knows? Let's wait a few more races before passing the verdict that Phelps is done. i am not sure why this useless arrogant phelps is even being allowed to play! he should have been banned. I'm an 80+ y/o guy who swam for Indiana University many years ago, 20 years before Mark Spitz, whom I knew, and the Doc Councilman era. Mark and Michael Phelps would have lapped me in any 400 meter event; look at the times in the record book. Doc C changed competitive swimming through his physiological training methods, and as a result, Mark and now Michael and Ryan, have been able to push their bodies to feats beyond what we ever imagined. I remember when Alan Ford of Yale was the first human to get under 50 seconds in the 100 YARD (not meters) freestyle (1947); no, I was not among those who then seemed to lower it every day. I went on to train in surgery, long days and nights then, off duty only every other night. But, that did not take the physical expenditure and the psychological commitment required in the training that led to my becoming the best I could be, just a slightly better than average Big Ten freestyle swimmer. After schooling and specialty training, I became pretty good at what I did, becoming a professor and then a vice president of a research and teaching institution. But, I have no medals, bronze, silver, or gold. Because I'm only a little better than the other doc. But Michael Phelps, Bryan Lochte, and everyone of those who qualified for the Games, they're not a little better, they're the world's best, physically, intellectually, and emotionally. The ignorant comments of some here who cannot know what it takes to become a world class athlete, or even a fair professor of surgery, are totally unwarranted and reflect upon the maker's own feelings of inadequacy. There are far too many swimming events. As a result 8 golds in swimming are worth less than 3 in track and field. We don't have running backwards, running sideways, and running with both feet tied together, so we should only have freestyle swimming: whatever gets you there fastest. Who cares? its just swimming. Its not like you swim everyday. Phelps had a GREAT career. If anyone wants his spot on the swim team, they will have it, when they swim better times than him. Dudes got well formed tricepts. It is called sports. Not conquest. People win and loose. Some make history (Phelps did that well). + Age and Pride are two things which slowly weaken a man. We cant expect someone to stay on top for many many years. Long live the legacy of Phelps. He is a blessed person. But there are billions of other people who equally deserve such blessings (I am not trying to lessen the importance of hard work here). Phelps gave the world a few could give. Now it is turn of others to carry on. Phelps coach admitted in a pre-Olympics interview Phelps had not done the same rigorous training he did prior to the last Olympics – but the fact he placed 4th in one single event, and everyone is sounding the death knell for his swimming career is ridiculous! He remains a great swimmer, capable of beating 99% of swimmers in the water. He also is human – and he admitted after the last olympics he became depressed and lost, like many before him who spent their lives chasing a dream, and once accomplished, were left with the cold reality of "what now?" Bravo to him for getting his stuff together and making a go of it, despite the overwhelming scruitiny of the media and unrelenting expectations of an unforgiving public. This is not a reality show, and there are no villians.... just athletes doing what they do best. He didn't train well enough for this go-around and I don't mean physically. I don't think his heart or head is in it. It could be he's just done. He had a good run abu it's hard to be a champion. What does Phelps have to prove? He's done it all. Oh! Nice swim Lochte in the 4 x 100... Oh it's not your specialty?! Didn't you just win the 400m IM? You had a huge fricken lead!!! Perhaps it is a pot-induced memory lapse: was I here, wasn't I just here, what am I doing here, am I swimming, am I in a pool, what year is it .... "I could have been a contender." Record Broken! # 19 BABY! ´s been beaten over and over and over... lately (this Olympic) and only got his 19th for being 1/4th of the team... There are others Mike... there are OTHERS.... !! And I can say that Mike..!! At 90 I can say that... I was good in my prime... nobody was near... but that lasted only.... HOW LONG ?? Nobody is a "legend" except in the eyes of his friends and "pushers"... Take it from this Ol´ So´n So who´s been around for 90 x 4 x 13 x 7 x 24 x 60 x 60 secs (plus) on this Planet "Mother Earth" and hasn´t given up yet..
Amanda Davies of CNN should know not to be biased and give personal opinions She is a reporter and should act like one, and be proffesional. Her reporting of Yi Shewen was disgusting. How about waiting for the results of the dope testing before you accuse and destroy a young athletes life, I found her reporting offensive and if the doping tests come back clear I would like to see her on CNN apologising. years, his performance leaves me in doubt. (too many questions needed to be asked.) Is it "American science " results, or is he a genius of cheating like Ben Johnson or he is just another American Frankenstein in sports. Love reading all these ridiculous remarks - now that Phelps has won his 21st medal - his third individual gold of these games. Why does everyone want to tear him down? His a good swimmer, certainly the most decorated swimmer, and Olympian, of all time. I'm proud to be watching him change the sport. So why does his success intimidate you? Hello there, simply was aware of your weblog via Google, and located that it is truly informative. I'm gonna be careful for brussels. I'll be grateful should you proceed this in future. Lots of other people will be benefited out of your writing. Cheers! Negativity does not go to the mountains; it goes to people that need cure. Michael Phelps is surely the greatest swimmer we have been privileged to watch in our life time. Hearty congratulations to him.